Sophisticated travelers are buzzing about Abu Dhabi, which is Dubai's must-visit neighbor in the United Arab Emirates. While Abu Dhabi is as much a shopping and dining capital as Dubai, it is becoming known as "the cultural Emirate" for its phenomenal artistic and architectural attractions. Visitors gawk at the Louvre Abu Dhabi and Guggenheim Abu Dhabi museums as well as marvel at the spectacular Sheikh Zayed Grand Mosque. For a place that was largely built in this millennium, there's a stunning array of things to do and see. Abu Dhabi's hotels are the ultimate in design and luxury, and many are set right on this emirate's endless, palm-shaded Arabian Gulf beach. Here are the most luxurious of the group. If you're you the kind of luxury traveler who likes staying in a castle or chateau, Emirates Palace Hotel Abu Dhabi is for you. This ultra-five-star hotel is run by Germany's luxury hotelier, Kempinski, and includes all the high-end features and amenities that upscale travelers love. Emirates Palace is set in the heart of Abu Dhabi, close to major visitor attractions such as the Sheikh Zayed Mosque and the Abu Dhabi National Exhibition Centre. The Marina Mall and other top shopping magnets are within walking distance. The hotel intends to remind guests of an Arabian palace complex, and it succeeds. Its 394 beautifully furnished and detailed accommodations are very spacious, starting at 600 square feet in size. Suites are indeed palatial. Emirates Palace draws culinary travelers with three full-service restaurants that serve Arabian, French, and Italian menus. Cafes and casual venues, indoors and out, cater to every taste. The hotel's afternoon tea is considered Abu Dhabi's best. Emirates Palace's stunning, 16,000-square-foot spa offers global treatments, a marble hammam steam room, and an ice cave. There's more here...a sand beach, two swimming pools, two TechnoGym fitness centers, various water sports, a kids' club, and a Bedouin adventure on camelback are right on the hotel grounds. Dubai-based Jumeirah Hotels, founded in 1997, has become synonymous with Emirati style and luxury. The company is now international, and its posh hotels (with Moroccan-style Talise Spas) beckon from London to China. 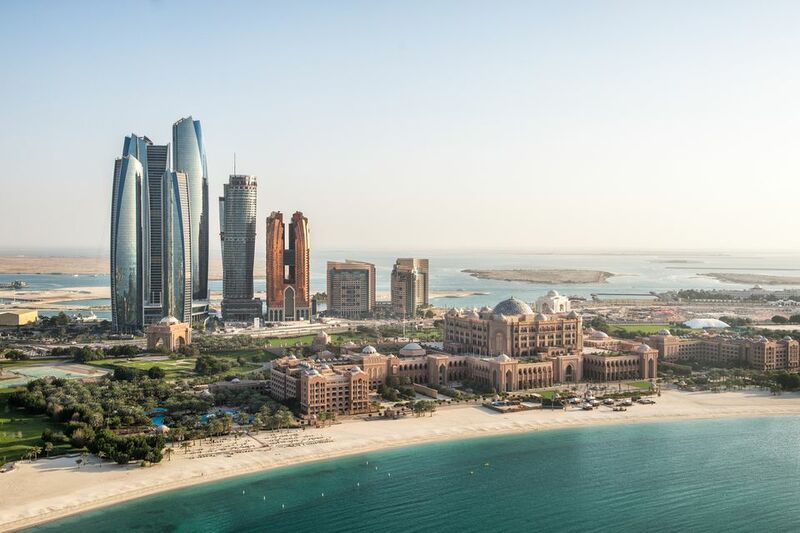 Jumeirah at Etihad Towers occupies one of the city's landmarks: it is one of the five slinky Etihad Towers prominent in any photo of the Abu Dhabi skyline. Guests savor the 68-floor skyscraper's drop-dead view from the hotel's observation deck and from its sky-high restaurants, bars, and cafes (which whip up a signature "camelccino" made with rich camel's milk). The hotel's 382 rooms are modern and lovely, with subtle, swirling Arabian patterns and floor-to-ceiling windows that capture the panorama. The vintage photos on the walls, of Abu Dhabi as a sleepy port 50 or 60 years ago, are from the personal collection of an Abu Dhabi sheikh. Set in the western part of the city, the hotel is not very close to tourist attractions. But Etihad Towers is a destination of its own, with a private beach, some of the best designer shopping in the Emirates, and an entire boulevard dedicated just to restaurants. And the service you get at this hotel is among the most dedicated and inspired in the entire world of hospitality. Four Seasons hotels claim enviable loyalty amongst luxury travelers: you always know what you're going to get. Four Seasons Hotel Abu Dhabi, opened in 2016, celebrates trademark standout service and understated luxury decor found in this chic hotel brand. Even in Abu Dhabi, which excels in design and hospitality, Four Seasons Hotel Abu Dhabi is a natural pick for uncompromising visitors. This hotel is set on one of Abu Dhabi's central islands, Al Maryah, and every one of its 200 unusually spacious rooms and suites has a water view. Since this island is devoted to entertainment, business, and shopping rather than recreation, there's no beach at the Four Seasons. Instead, the hotel has built a vast, palm-shaded outdoor terrace on its third floor, which it calls an "urban sanctuary." Many guests make it their hangout spot, taking advantage of its luscious infinity pool, ultra-comfy loungers, and dining and drinking spots. For double relaxation, the hotel's Dahlia Spa opens right onto the deck. The hotel's half-dozen creative restaurants serve delectable menus; Café Milano is an offshoot of the original in Washington, D.C. The hotel offers two cutting-edge, water-view fitness centers: one for ladies and one for gents. This hard-working urban resort offers a complete Abu Dhabi vacation, all wrapped up in Four Seasons style and service. Rosewood Hotels & Resorts' refined style is making a splash in the luxury travel world. The Rosewood Abu Dhabi appeals to urbane visitors who will appreciate its seriously five-star finesse and personal butler service. The hotel is set in a sleek 34-story waterside tower in the Al Maryah district across a creek from downtown, offering dazzling views of the city and the gleaming Arabian Gulf. The Rosewood's 189 guest rooms and suites are done in quiet luxury, with soothing accents of natural wood and spa-like bathrooms with both a soaking tub and walk-in rainfall shower. The hotel's dining has made it a destination for locals and non-guests; highlights include a lavish Chinese restaurant, a Japanese izakaya grill, an Italian trattoria, an Arabian kitchen, and even a Peruvian spot. Lounging is an art here, and guests savor a wine bar, cigar bar, craft cocktail bar, and shisha smoking lounge. Shoppers are moments from the Abu Dhabi Mall and The Galleria. As you might expect from a hotel of this quality, the spa is elegant, the gym is open 24 hours, and the sandy beach is private. One typically thoughtful touch: the outdoor pool is heated in winter and cooled in summer. Zaya Nurai Island is a tranquil beach resort set on a private isle within the city of Abu Dhabi. Nurai Island hugs the shores of the bigger Saadiyat Island, which is devoted 100 percent to leisure, the arts, and the beach. Zaya Nurai Island guests get to relish a quiet beach vacation in the midst of one of the world's most exciting cultural hubs. Zaya Nurai Island is an enchanted private domain of its own, yet mere minutes to Ferrari World, Yas Waterworld, Gary Player's championship golf course, the Louvre Abu Dhabi, and the Guggenheim Abu Dhabi. Zaya Nurai Island is a high-end design resort composed exclusively of quiet private villas opening onto the Tiffany-blue Arabian Gulf. Ranging from one bedroom to six, villas are done in soothing, uncluttered, and contemporary style in sync with the sand and sea. The property garners industry praise along the lines of "one of the world's most incredible island resorts" (Condé Nast Traveller UK) and "Best Boutique Hotel Arabia" (World Travel Awards). Zaya Nurai Island is a magnet for local "staycations" as well as for destination vacations. It appeals to couples desiring a romantic getaway as well as active families seeking nonstop action. Dozens of land and sea activities are on tap, though some guests come to simply recharge under the sun and by the surf. Varied dining options cover Mexican, Lebanese, sushi, steak, pizza, pasta, and more. The St. Regis Abu Dhabi is a grand hotel: a big hotel flaunting a reputation to match, a see-and-be-seen lobby, and a location that everyone knows. This hotel is situated on the Corniche, which is an elegant waterfront boulevard with major attractions such as Marina Mall. Every one of the St. Regis's 283 rooms overlooks the Corniche and many capture views of the Arabian Gulf's blue-green waters. Rooms and suites begin at an impressive 645 square feet, with plush modern décor. Welcome guest perks include complimentary valet parking, Wi-Fi, and personal butler service, for which the St. Regis brand is renowned. Nearly every guest takes advantage of the hotel's relaxation station, Nation Riviera Beach Club, which is also an elite private club. Its enticements include a lovely lounging pool, a lap pool, men's and women's fitness rooms, and a glorious beach complete with cabanas and a bar-and-grill. The St. Regis's Remède Spa, overlooking the beach, treats patrons to Champagne and chocolate truffles. Dining at the hotel is done with theatrical flair: live chef stations prepare Arabian treats during dinner at The Terrace on the Corniche, and the monthly Brunch in the Clouds promises an experiential culinary journey in a 49th-floor suite. Yas Hotel Abu Dhabi is unique in several ways. This futuristic hotel is clad in an LED spiderweb canopy with constant lighting effects and a purple glow at night (you can imagine a nightclub ducked right inside the dome). The hotel perches directly atop a Formula 1 track, making the hotel as famous as the track. This is a large hotel, with 499 rooms that overlook the track or a yacht-filled marina. Yas Hotel Abu Dhabi is social and busy, appealing to millennials and young families who like its space-age look, tech orientation, and ambient music. Active visitors also appreciate the hotel's location on sporty Yas Island, near Yas Waterworld, Ferrari World (and its crazy coasters), championship golf courses, and crystal-clear scuba-diving sites. This hotel is as cool inside as out, with more than a dozen dining and drinking venues, a spa, two rooftop pools, and social areas including an electronic library and hidden lobby nooks. Naturally, there's a great hotel beach. If seeing the Sheikh Zayed Grand Mosque with your own eyes is one of the reasons you've chosen to vacation in Abu Dhabi, Fairmont Bab Al Bahr might be for you. This luxury hotel attracts elite (and bold-face) visitors with its breathtaking views of the mosque from many rooms. The hotel is ultra-modern and high-tech, but is imbued with a rich sense of place: you are here in royal Arabia, with the sparkling Arabian Gulf steps away. This graceful hotel is impressively designed. It wows guests with its immense lobby filled with sculpted lights and with its meandering, palm-shaded pool oasis, which is so seductive that many guests never take advantage of the hotel's free shuttle to Abu Dhabi attractions. Fitness swimmers have another reason not to budge: the hotel's Olympic-size pool. Fairmont Bab Al Bahr's 369 rooms and suites are fashionable and deluxe, featuring spa-like bathrooms and floor-to-ceiling windows framing the panorama of city, sea, and sky. On-property dining includes two restaurants run by British celeb chef Marco Pierre White plus the Cedar Lounge (with belly dancers), a Chocolate Gallery, and a tea lounge. Two gyms cater to either men or women, in Emirati tradition. The hotel has its own beach but no spa, though therapists are at the ready for in-room massages. Park Hyatt Abu Dhabi is set on Abu Dhabi's pristine and vast Saadiyat Beach and is surrounded by Saadiyat Beach Golf Club, making it is a serene beach and golf resort within this vibrant waterfront city. Here, you can live the barefoot life and spend your days swimming or kayaking under the warm sun, lazing in the hotel's hushed spa, splashing in its vast landscaped pool, or perfecting your swing on Gary Player's 18-hole golf course. Every lovely room or villa at this resort has a balcony or terrace overlooking the beach, pools, or tropical gardens. You are truly in nature here, even as you dine at the hotel's elegant steakhouse, Mediterranean restaurant, or Lebanese cafe. The feeling that guests report in online reviews is a sense of being at one with the Arabian Gulf's turquoise waters and Abu Dhabi's benevolent sun. Yet Abu Dhabi's extravagant cultural attractions beckon mere moments from this wild beauty. The Louvre Abu Dhabi, Guggenheim Abu Dhabi, and Zayed National Museum are minutes away on this island. Staying on Saadiyat Beach means you miss none of the excitement of Abu Dhabi. Abu Dhabi's luxury hotels tend to resemble Arabian palaces or opulent high-rise aeries. Not The Ritz-Carlton Abu Dhabi, Grand Canal, whose originality is hinted in its name. This handsome urban resort is designed to resemble Venice, with a Venetian Village complete with romantic footbridges spanning canals complete with gondolas. Yet this resort never lets you forget you are in the midst of one of the world's most dynamic, future-oriented cities. The Ritz-Carlton Abu Dhabi, Grand Canal offers guests diverse experiences such as a powder-sand Arabian Gulf beach, a 17,000-square-foot pool, a Bedouin-themed ESPA, and restaurants ranging from Chinese to steak and Italian to Arabian. This large resort's 532 spacious accommodations range from sunny rooms and suites to two-bedroom villas with private plunge pools. Guests can opt to stay in the resort's Venetian Village complex and glide around on a gondola. Visitors find it hard to tear themselves away from this everything-you-want resort. But when they do, they are moments away from many of Abu Dhabi's must-see attractions, including the breathtaking Sheikh Zayed Grand Mosque. The Ritz-Carlton brand is famed for its signature service (every staffer seems to know who you are) and its lavish club-floor lounges. Both are in force here. The service is exceptional and so is the penthouse Club Lounge, where club-level guests are awed by artful culinary creations and by Abu Dhabi's glittering skyline. The service-focused St. Regis brand has a second property in Abu Dhabi, The St. Regis Saadiyat Island Resort. This is an elegant hotel-style resort, not a string of individual villas, on Abu Dhabi's beach island, Saadiyat. The resort's pristine stretch of sand beckons guests to lounge in the sunshine, and active guests can enjoy watersports, pool swimming, and on-property tennis. The resort is popular with diners eager to try out its restaurants, which are repeat winners of Time Out Abu Dhabi awards. And The St. Regis Saadiyat Island woos golfers with its access to the Gary Player-designed championship course at the Saadiyat Beach Golf Club. The course's 18 holes are challenging and rewarding, offering tricky hole designs, old-growth palm trees, and native wildlife such as mountain gazelles, humpback dolphins, green and hawksbill turtles, and a rainbow of migrating birds. Just minutes from the resort, the Saadiyat Cultural District is home to the Louvre Abu Dhabi, Guggenheim Abu Dhabi, the Performing Arts Center, and the future Zayed National Museum. The Shangri-La Hotel Abu Dhabi is an ideal roost for visitors seeking a city vacation that is also a beach vacation. This unique property, built of shimmering white stone that appears gold in the sun, is built on a Venice-style seafront neighborhood of canals. The Shangri-La is a soothing aquatic world where you are never far from crystalline waters. Every one of the hotel's 213 guest rooms and suites (plus 161 residential apartments) owns a water view. The Arabian Gulf side of the hotel boasts one of Abu Dhabi's biggest beaches: a full half-mile long, laden with sunbeds and loungers. Two palm-ringed pools deliver a view of downtown, and guests have use of a lap pool at the extensive fitness center. Kids have a pool and playground of their own. The hotel's Chi Spa features an Arabian spa with a marble hammam steam lounge and hydrotherapy treatments. Guests are whisked around the property via Emirati gondolas called abras, which are quick to deliver them to the hotel's renowned restaurants that serve French, Middle Eastern, Chinese, and Vietnamese fare. The Eastern Mangroves Hotel and Spa and Anantara is set in Abu Dhabi's protected aquatic forest, the Eastern Mangroves District. Guests feel like they're on a remote tropical island, with vivid marine life in the water and exotic birdsong in the air. Despite its natural setting, the hotel is only 10 minutes to the heart of the city and 20 minutes to Abu Dhabi's airport. All the hotel's 222 rooms and suites are exceptionally spacious, beginning at more than 600 square feet. They are contemporary and comfortable, with subtle touches of classic Arabian design. Every room features a balcony that frames views of the mangrove lagoon or the city skyline. Some accommodations have private plunge pools. A huge infinity pool invites swimmers and splashers; since the mangrove forest is protected, there's no beach. However, guests can wildlife-spot while kayaking through the forest, which is an unforgettable experience. The hotel's all-day Ingredients restaurant is an Abu Dhabi dining destination, cooking up culinary specialties from around the world. Diners rave online about Ingredients' fresh, light Arabian mezzeh appetizers, Indonesian satays, and the sushi bar. The hotel's parent brand, Anantara, is based in Bangkok, and Eastern Mangroves guests enjoy a completely authentic Thai restaurant. The on-property Anantara Spa is designed with a marble hammam, a Turkish steam room. Spa patrons can indulge in fragrant, desert-inspired treatments as well as knot-untying Thai massage—and spa packages offer multiple treatments for hours of bliss. Qasr Al Sarab Desert Resort by Anantara is a subdued, elegant Arabian oasis set amidst the majestic red-sand dunes of the Liwa Desert. Set a photogenic two-hour drive through the desert from Abu Dhabi city, this tranquil resort awaits serenity-seekers. Qasr Al Sarab Desert Resort offers pure leisure and relaxation both indoors and out. Its 206 rooms and suites are spacious and inviting, with pillows everywhere, indulgent bathrooms with deep soaking tubs, and glorious desert views. Guests have their pick of three restaurants (serving a free breakfast) and a plethora of services at the spa, which is complete with a hammam marble steam lounge. This gracious resort's vast, palm-ringed pool beckons guests to savor the soul-warming desert sun and the spectacular desert night sky. By day, the resort specializes in dune treks via camel or ATV, and kids and teens have clubs all their own. InterContinental Abu Dhabi is not as over-the-top design-wise as Abu Dhabi's other five-star-hotels, but it offers no-question five-star amenities and views. For what you get, this hotel is a great value. InterContinental Abu Dhabi has two features that many of the others lack: it is set on a private marina and has a real sand beach (as opposed to a pool terrace, like most in-town Abu Dhabi hotels). The hotel is splendidly located beside Jumeirah at Etihad Towers just off the Corniche, which is Abu Dhabi's strolling-and-shopping boulevard. The InterContinental's rooms are handsome and comfortable, if not over-the-top luxurious. Every room has a view of either the city or the Arabian Gulf. Airy suites flaunt spa-like bathrooms with whirlpool tubs. The hotel's restaurants serve cuisines that are not easy to find in Abu Dhabi: a Brazilian rodizio (roasted meats on skewers), a Belgian café (waffles, beef stew, and draft beer), and a Pan-Asian kitchen (Chinese, Japanese, Thai, and Vietnamese food). Byblos restaurant, overlooking the marina, serves Beirut-style specialties such as roast lamb, mint-strewn salad, and silky hummus. Though this hotel excels with business travel and meetings, it is at heart a place for lounging: at a restaurant or bar table, on the sandy beach, in the 24-hour fitness center, and in the bliss-inducing in-house spa.